Nine distinct personality dimensions built from one set of questions. No other personality assessment gives you as much depth and breadth as a Livstyle assessment. Team Overlays that show how you interact with your coworkers. This exclusive feature is only found in Livstyle Personality Assessments, and is a powerful way to visually represent the synergies of your team. The option of selecting from four individual products— Workstyle, Ministrystyle, Youthstyle, and Ministrystyle for Teens—that allow you to view the assessment in the context most useful to you. Our flagship product for the workplace enables you to identify not only the individuals you need for your company, but also shows you what you need to do to make sure you have the right combination of skill sets in one or more teams, improving performance and retention. Spiritual disciplines are sometimes affected as much by personality as any other factor, Ministrystyle describes how each individual handles these disciplines. Ministrystyle is an effective tool for churches, faith-based non-profit organizations, and individuals. Also available specifically for Christian youth. Marriages are made stronger through mutual vulnerability leading to more effective partnership. Marriagestyle is built for married couples who desire increased unity within their marriage through deeper understanding of one another. This tool identifies all you wished you had known about your personality, motivation and decision-making styles when you were a teen. It allows teens to understand how to relate more effectively to others and how to navigate school, work, and choices for the future. Livstyle Personality Portraits were created after six years of research by Denny Howard, the founding Director of the Family Care Center in Fort Wayne, Indiana. Over the years, the assessment has gone from being a hand-scored pen-and-paper form to the online assessment it is today, all retaining the validity and reliability that Denny demanded. For over twenty years, non-profit organizations have integrated Livstyle portraits into the pursuit of their mission. Your Livstyle personality portrait empowers you to approach every interpersonal interaction with more knowledge about yourself and those around you, leading to better outcomes for everyone. Thousands of people have unlocked their potential through Livstyle Personality Portraits, but don’t take our word for it. Read through a few testimonials from people just like you. Using Ministrystyle has changed the way we work as a team at Crossover. We quickly understood that the time spent to develop a culture of knowing each other on our team is far more effective in the long run. I found Ministrystyle comprehensive and far reaching in describing the personality/ management styles of those tested, and was delighted with its accuracy AND usefulness. It’s easy for a novice to use, though expert psychologists also respect this very scientific instrument–which combines aspects of several well-known psychological tests, and which has been thoroughly validated statistically, a work that took some 20 years in the making! What a different, uncanny, humbling way to get the feedback that validates what God and “…a multitude of counselors” have been telling us about ourselves for a lifetime! My wife, Tiffani, and I have been using Ministrystyle in our church’s Marriage Ministry for several years. Ministrystyle is an invaluable resource for us to help couples—both married and during pre-marriage preparation—gain deeper insight and understanding into one another, and with that understanding, greater appreciation. Many couples have responded by saying, “You mean my spouse is not intentionally trying to aggravate me—it is because of our diverse personalities and differences in preferences? This has given us new hope that our relationship cannot only just survive, but grow and prosper! A person’s character, calling and competency all play important roles in his contribution to the team. Yet, the chemistry between the various teammates also exerts tremendous influence. Workstyle and Ministrystyle always provide a great insight in a number of areas as to how a potential person might fit on the team or why a current person impacts the team the way he does. A great resource! We’ve used Workstyle and Ministrystyle Profiles for many years. It is the best overall snapshot of a person to identify their position fit. In our Staffing Consultations, we always use these Livstyles tools to help us identify whether the right people on the bus are in the right seats on the staff. The Workstyle and Ministrystyle Profile is such an excellent tool because it identifies the uniqueness of each person rather than scoring good or bad qualities. It’s a good discovery tool for each person to understand how God has created him or her and, therefore, where he or she fit in the workplace or in ministry. 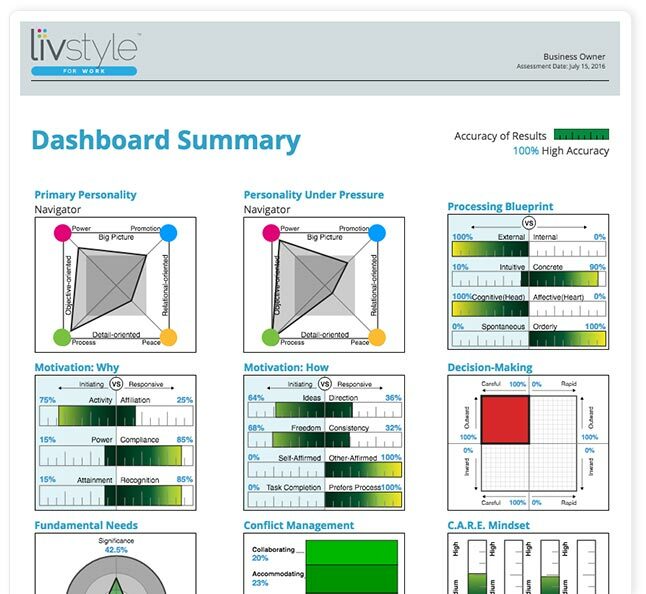 We recently started using Livstyle assessments with our leadership team, and the results have been great. The assessments have helped us gain a deeper understanding of one another, and we have started working more effectively as a team. Ministrystyle has proven invaluable to Leadership Resources. As a mission organization, we place great value on healthy relationships. Ministrystyle has enabled us to go even deeper and healthier. By using the Ministrystyle tools and through interaction with the Ministrystyle training and coaching team, we’ve gained greater understanding of one another’s strengths and vulnerabilities, the way we each process, and our default ways of responding. We’re better able to value each other’s God-shaped gifting and harness those as strengths rather than allow ourselves to be frustrated by our differences. The end result: a team that really enjoys working with one another and a ministry that’s more effective as a result. If there is a prevailing issue besetting many of our churches today, it’s the breakdown of relationships on teams. Whether it’s pastor/board, pastor/staff or staff/staff, often we who should be expert at working together often fail at it, and become less of a team and more of a bunch of people all heading in the same directions. Ministrystyle is one of the first tools I reach for when asked to help a church staff learn to function better and with greater impact. Not only does it give great insight into our “internal wiring” but it also helps promote team dialogue. I recommend it highly! President	, Pinnacle Ministries, Inc.
How can Livstyle improve your organization?